To see traveler tips, more things to do, and tourist information, use the Melbourne day trip planning app . London, UK to Melbourne is an approximately 24-hour flight. You can also do a combination of flight and shuttle; or do a combination of flight and train. You'll lose 10 hours traveling from London to Melbourne due to the time zone difference. Prepare for a bit warmer weather when traveling from London in April: high temperatures in Melbourne hover around 23°C and lows are around 11°C. On the 22nd (Mon), you'll travel to Port Campbell. Port Campbell is a coastal town in Victoria, Australia. 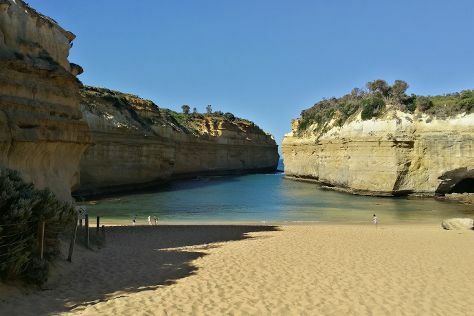 On the 23rd (Tue), don't miss a visit to Gibsons Steps, then get great views at Loch Ard Gorge, and then take in the dramatic natural features at The Razorback. To find more things to do, where to stay, photos, and more tourist information, refer to the Port Campbell online vacation planner . Drive from Melbourne to Port Campbell in 3.5 hours. Alternatively, you can do a combination of flight and bus; or do a combination of train and bus. Wrap up your sightseeing by early afternoon on the 23rd (Tue) to allow time for travel back home.